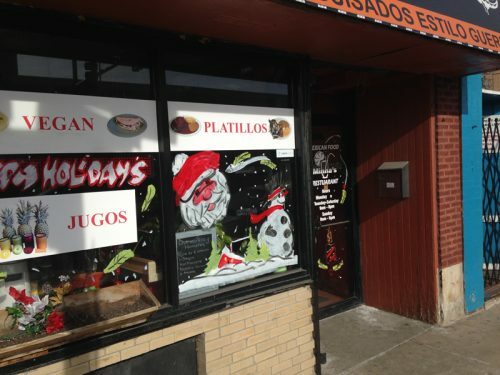 IT WAS A PARLOR GAME WE USED TO PLAY ON CHOWHOUND: name the best eating strip in Chicago. The block or couple of blocks that gave you the most interesting food, interrupted by the fewest obvious duds, within a relatively compact area in the city. Besides being an excuse to talk about the restaurants themselves, it got you thinking about what made a great eating street. One of us used to advocate for a stretch of Central Avenue that included Polish, Greek, Mexican and more, a United Nations of neighborhood family dining. (You could have gotten a Ph.D out of the contents of the bread baskets alone.) But is so much diversity actually better than density of one kind of thing? I don’t think Chinatown’s deep dive into Asian food would be better if there were Italian and sports bar burgers scattered through it, for instance. 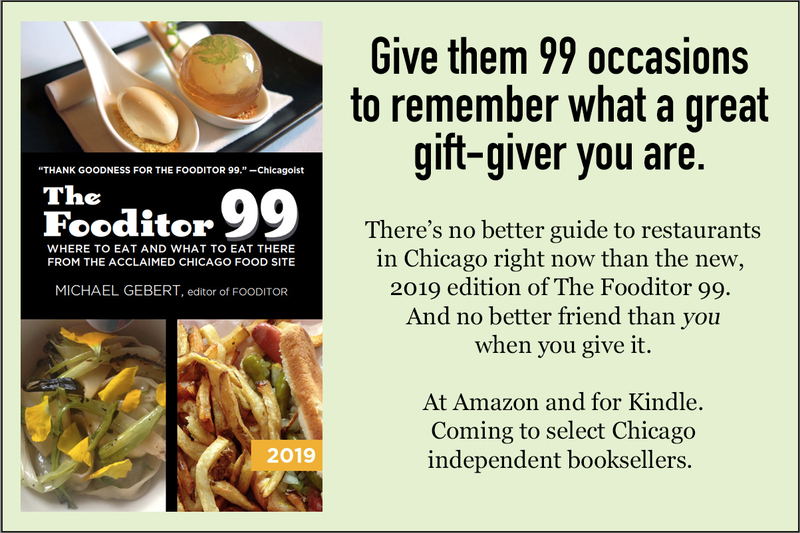 You could debate it all day—and we did, a foodie equivalent of the obsessive music list-making Nick Hornby chronicled in High Fidelity. I got to thinking about this old game when I went to try a recent discovery of Fooditor contributor Titus Ruscitti (whose blog Smokin’ Chokin’ and Chowing With the King is, in case you haven’t noticed from its frequent mentions in Buzz List, one of the three or four most essential publications on food in Chicago), Morena’s Kitchen. The hitch was, Morena’s was closed for a family emergency when I got there. 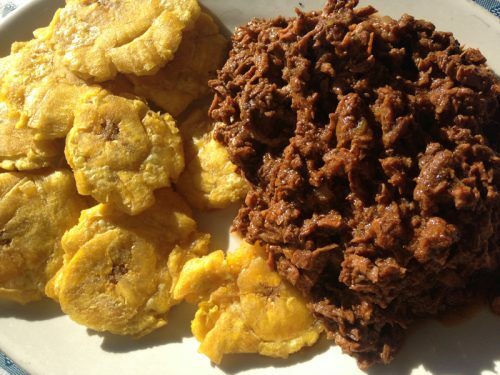 So I went to a different woman-owned Latin restaurant starting with M on the same block, Minna’s—and it was great too. 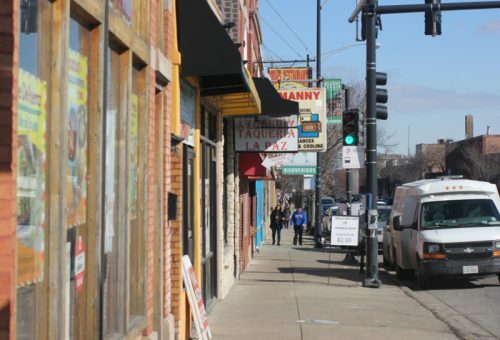 And so I hereby declare it, go ahead and argue with me if you want—the best eating block in Chicago (for 2018) is the 5000 block of Armitage, between Lawler and Leclaire and at the point where Grand runs into Armitage, overlooking the little-known (but totally real) historical neighborhood of Whiskey Point. It’s literally just one side of the street (we’ll ignore the Dunkin’ Donuts on the other), and just four restaurants, three Mexican and one Dominican. 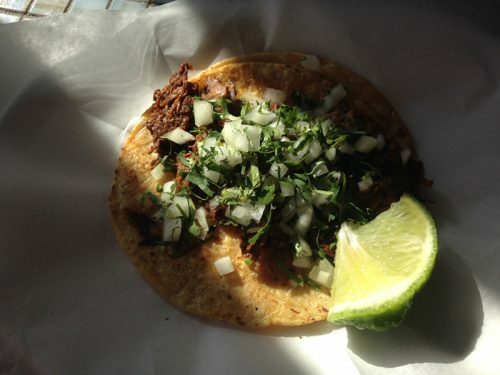 Yet, as I found when I did this earlier guide to Mexican on the west side, the most underreported food story in town might be how rich and authentic Mexican food is on the west side of Chicago. Belmont-Cragin is an industrial nothing-special part of Chicago—though you sure have your pick of places to get a car wash—but probably precisely because it’s not looking to draw people beyond its own mostly Latino neighbors, the Mexican food average is extremely high, and often goes beyond taco stands to take in all sorts of regional specialties. If this one block is so good, it’s just Belmont-Cragin in microcosm. 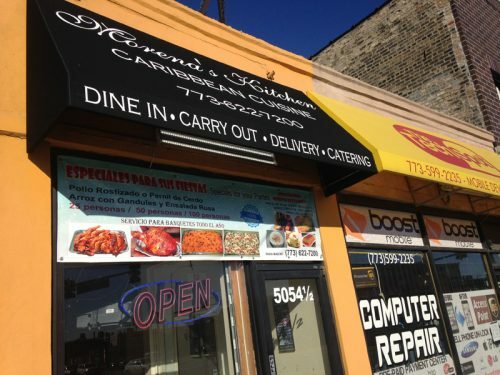 So here they are, the four at least pretty good, sometimes very very good restaurants of 5000 W. Armitage, with all due thanks to Titus Ruscitti, without whom I probably would never have thought to stop the car and explore this obscure block on foot and with fork. 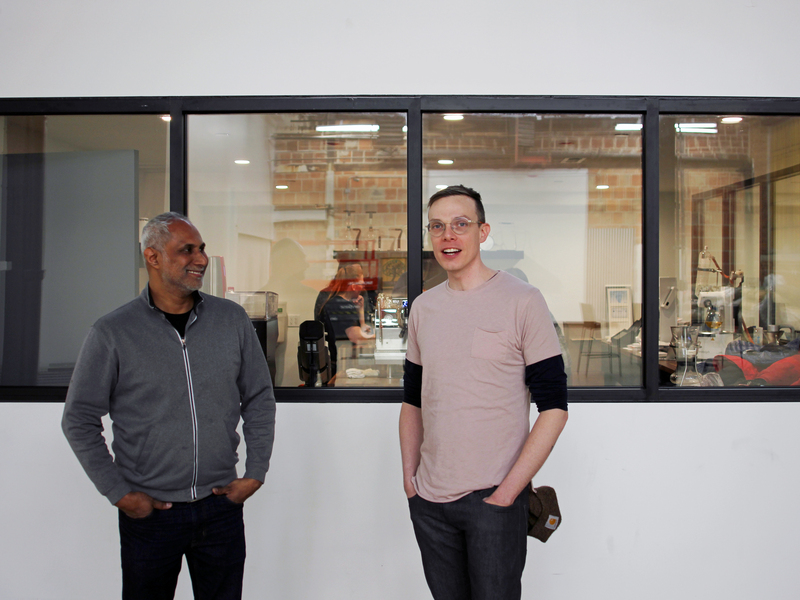 The first place you’re going to go, without a doubt, is Morena’s Kitchen, which Titus first called attention to and has since been reviewed by Mike Sula and talked about at LTHForum. 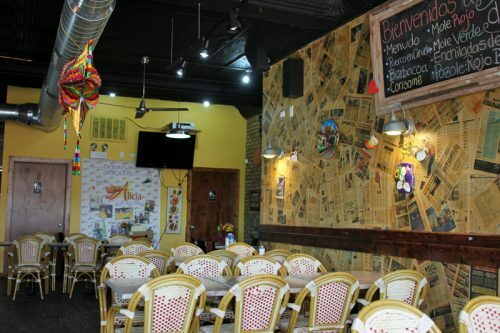 And it should be the first place—it’s a winner on all levels, not just the best Dominican restaurant I’ve been to (that’s a short list) but one of the very best restaurants from any part of the Caribbean in Chicago. 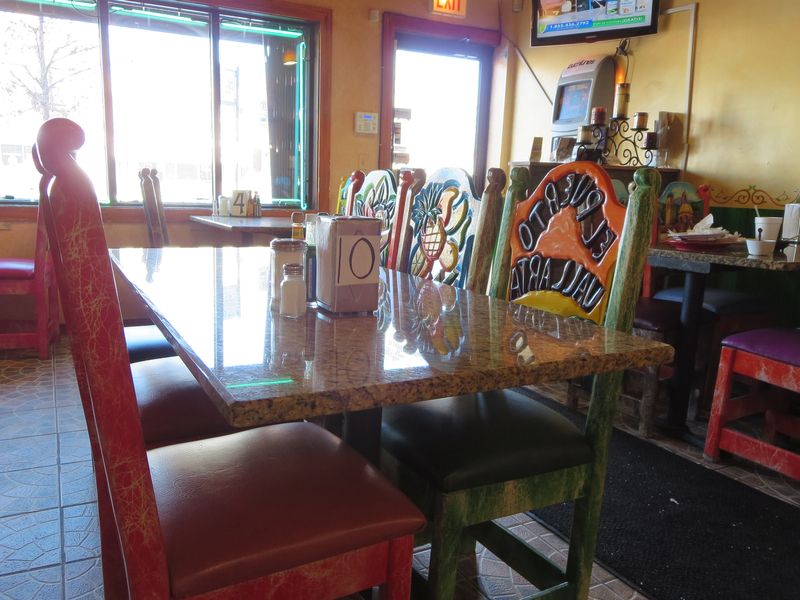 Morena’s menu board has the typical things you expect to see at an island restaurant—and also typically, what you want may or may not be being made that day. 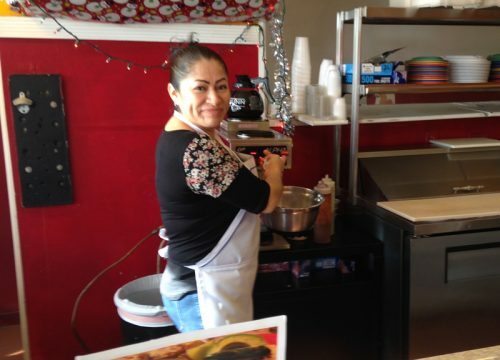 But considering she’s a one-woman kitchen, she’s cranking out a lot of choices, from menudo for breakfast to oxtail (though it had paper pasted over it the last time I saw) to sancocho, a hearty stew with beef, chicken and lots of vegetables. 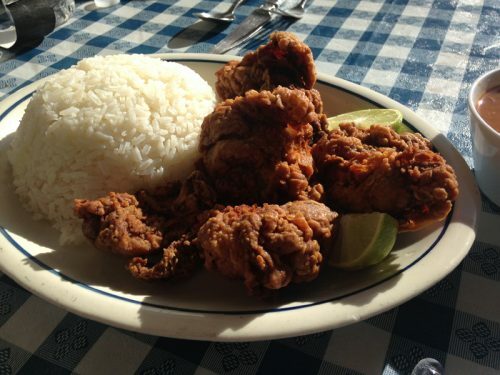 the #1 reason to make the schlep to the west end of Armitage is the Pica Pollo aka Dominican Fried Chicken. It is in my opinion the best fried chicken in the city at the moment. I judge this solely off cravings and I continue to get them for this fresh fried juicy well seasoned bird. 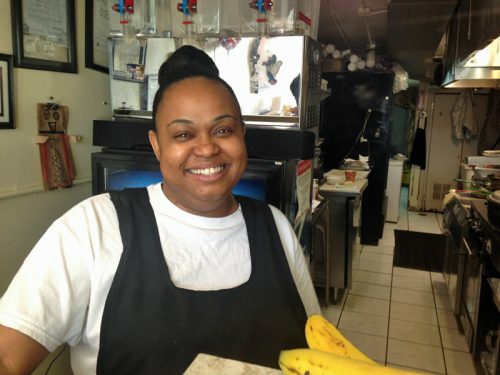 You’ll notice the regulars call their order in and they know this chicken isn’t pre-made so expect to wait the time it takes her to dip it into the batter and then fry it to order. Best, I don’t know, but it’s awfully good, although the butchering of the chicken follows some eccentric island model, so you never know what you’re going to bite into. The key to this and indeed a lot of the dishes comes from Dominican oregano (Lippia micromeria), which like Mexican oregano is a different plant entirely from the oregano used in European cooking. It gives the chicken a bright, tangy grassy-spicy flavor—and means the oil running down your arm is chartreuse-colored. 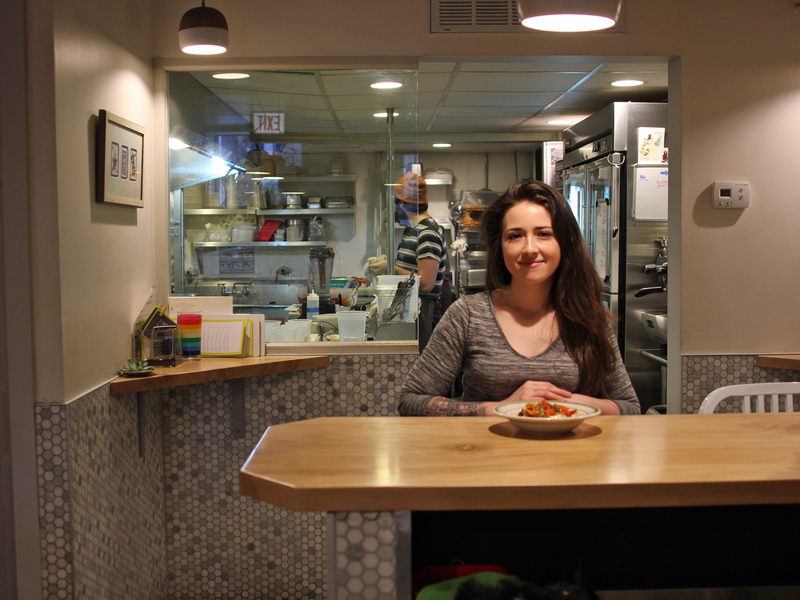 Everything is made by hand in the kitchen of this one-woman show, and indeed the kitchen takes up most of the space, leaving minimal seating—though in the next month or two she plans to take over the empty cell phone store next door and have a full dining room. (Sitting in the front window right now can be a bit sauna-like.) Morena herself is as sweet as she can be, and more than anything about this block, I look forward to returning from time to time and seeing what’s coming out of her kitchen that day. Minna’s (spelled Mina’s on one sign, but I’m sticking with Minna’s) is where I went the first time I tried to visit Morena’s, and I was happy as soon as I walked into the lively Mexican diner and took a stool at the counter. I looked at the menu and saw a variety of what you might call short order Mexican plates, but then I looked at what Minna was cooking right in front of me, and it looked fantastic. 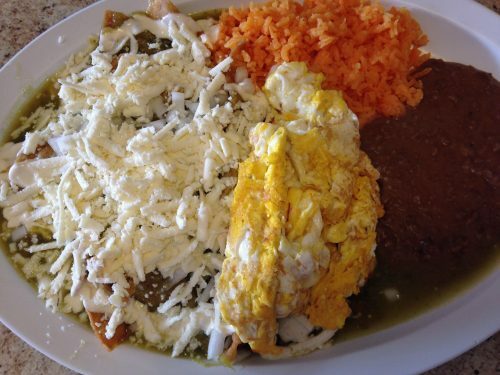 I asked the waitress what it was and she said chilaquiles, and I said, I’ll have that. It was as cheerfully filling as anything you could get in a truckstop on I-80. Also cheering was the constant interaction between the all–female staff—Minna and her daughter—and the working men grabbing a late breakfast. (That might have been Grandma working in the back, too, I saw a lot of family resemblances.) It’s a lively place worth a stop for breakfast sometime, especially if you need carbs and spices to soak things up. 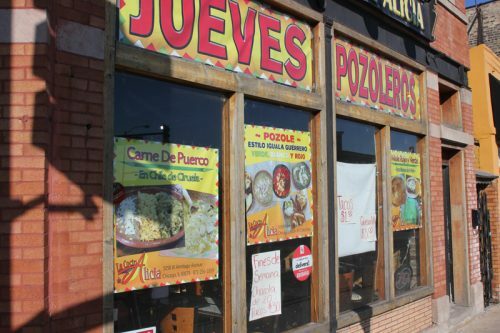 Titus pointed out to me that they’re from Potosi, so the next thing to try, for sure, is enchiladas Potosinas. 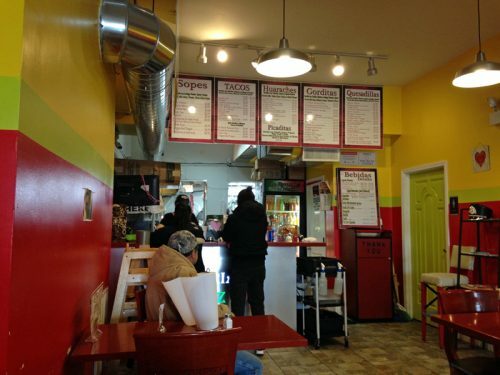 I believe there’s something really good on the menu at Taqueria La Paz—it feels like all the elements are there. They make handmade tortillas (I could see an older lady in the back patting them out the whole time I was there), an assortment of pretty good meats running from steak to lengua, unusual items like huitlacoche and squash blossoms for the quesadillas, and so on. But I didn’t quite find the perfect combination on my one visit so far. The standard topping for tacos includes lettuce and tomato, and though I knew this was probably a bad idea (versus simple cilantro and onion), I felt it was worth having it their way before I went messing with it to my tastes. Well, as suspected, the combination of thick tortillas and flavorless lettuce and tomato took away a lot from the pretty good meats inside. Order more plainly and you’ll probably get closer to the best offerings here. La Cocina de Alicia advertises a DJ on weekend nights, and the music was blaring when I walked in, but the place was otherwise empty. Which means lunch is probably not the time to see it in all its glory, and indeed it seemed like they weren’t quite sure at first why I was there. It was funny to think that just next door I had walked past an assortment of internet foodies sitting in the front window at Morena’s, a common sight by now, while here, the arrival of an obvious gringo from outside the neighborhood was treated like it was the first time any such thing had ever happened. 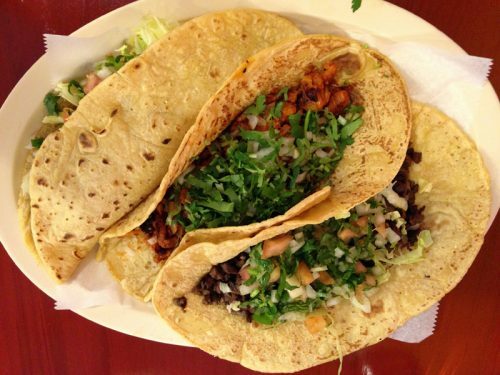 One interesting thing—as at Taqueria La Paz, the housemade tortillas are much larger than you typically see—8 or 9 inches across as opposed to six. Another thing that was interesting was that the red salsa at both places was not just spicy, but incendiarily so (from La Paz I tweeted, “If I am never seen alive again, please arrest this salsa”). They aren’t catering to a gringo crowd at either place, that’s for sure. The barbacoa was nice, lightly but definitely spiced. 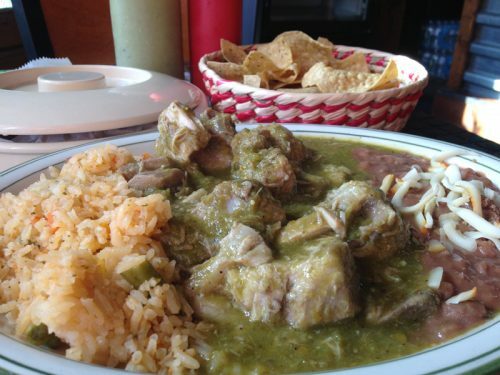 Interestingly, it made me think of the carne guisado at Morena’s, even though her spicing is different. La Cocina de Alicia seems to me close to being about as untouched by contact with the gringo foodie world as any Mexican place in town I’ve been to, and after Morena’s, I suspect it’s the one I’ll return to the most to see what else they offer that I’ve never seen or tasted before. 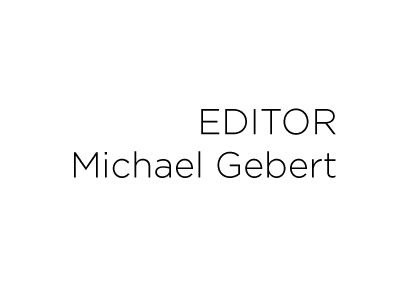 Michael Gebert has a plum job as editor of Fooditor.